Reading aloud is an ideal activity to follow a free play session when the children are ready to sit still and be calm for a while. It fosters listening skills that are the basis of the learning process, encourages a love of books and instils a desire in the children to be able to read the stories themselves. Whilst the children I read to love traditional tales such as The Gingerbread Man or Snow White and the Seven Dwarfs, we usually read contemporary stories. I’m listing some of our favourite books here. 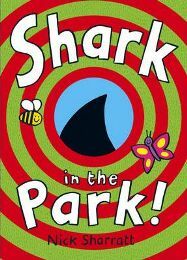 Shark in the Park by Nick Sharratt (Corgi Childrens, ISBN 0552549770) is the story of a young boy, Timothy Pope, who goes to the park with his telescope (which obviously rhymes with his name). Each time he looks through the telescope, he sees something that looks like the black fin of a shark, so he shouts out ‘There’s a shark in the park!’. This is repeated several times throughout the book, and the children know when it’s coming and love to shout the phrase out themselves each time. Of course what Timothy sees is not a shark; the first time it’s a cat’s ear, once it’s his father’s quiff, another time a bird’s wing, and so on. Great amusement. As his father finally decides to take him home, they turn their backs on the park and there in the duck pond appears an ominous black fin. The repetition and the humour both make this a popular story. 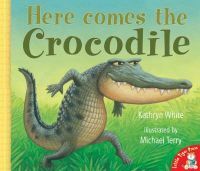 Here Comes the Crocodile by Kathryn White and Michael Terry (Little Tiger Press, ISBN 185430979X) is perhaps our greatest favourite, and one which also lends itself particularly well to drama sessions too. The scene is set in the hot, green jungle, and as the crocodile stirs in the river he sends a shiver throughout. He’s hungry and on the lookout for his prey. Encountering several animals such as monkeys, flamingos, an elephant and a zebra, he threatens each of them in turn. They each have an excuse at the ready: the elephant claims that he is made of solid grey rock and will break the crocodile’s teeth, whereas the zebra says his black stripes are pepper and his white stripes salt. The flamingos insist they are made of candy floss which will make the crocodile sick. Having failed to trap any of the animals, the crocodile is by that time so hungry that he rolls on his back crying’ ‘Boo-hoo, I want my mummy!’ The reader can put so much expression into this that it sounds ridiculous and will have the children curling up with laughter. The animals all take pity on the crocodile, so the monkey shares some bananas, the zebra offers grass and the elephant gives a generous spray of water from his trunk. They are all together and thinking how wonderful life is when suddenly a tiger springs out of nowhere saying ‘I am ready for tea!’ This is another opportunity for putting plenty of expression into your voice, and as the story ends we discuss who will win the fight: the crocodile or the tiger? The text is in the form of a rhyming poem, and included in the illustrations is an image of what would happen to the crocodile if he ate that particular animal. A wonderful book. 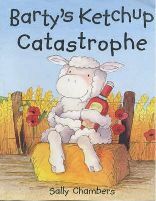 Barty’s Ketchup Catastrophe by Sally Chambers (Piccadilly Press Ltd, ISBN 1853404845) is a story that the children never tire of. Barty is actually a sheep who is obsessed with tomato ketchup. He has it on everything: his breakfast cereal, his sandwiches at school, and even on birthday cake, at which point the children always come out with a chorus of ‘Uughh!’ and we all agree that none of us would eat cake with tomato ketchup. One day Barty is invited to a sleepover at his friend Cedric’s house. He is so excited and eagerly packs his overnight bag. Even though the children I read to are only four years old, they do already go to sleepovers and can easily identify with Barty’s excitement. When Barty arrives at Cedric’s, they play in his room until it’s time for tea. Pizza is served, with grass topping of course, and Barty asks for some ketchup. Horror of horrors, Cedric’s mum looks in the cupboard and announces that there isn’t any. Barty sits quietly for a while, too embarrassed to cry, and has a drink. Eventually he decides to try the pizza and finds that it isn’t so bad after all without ketchup. When he returns home his family wonder if he has got over his obsession, but no. Next time he is invited to Cedric’s he makes absolutely sure he has packed the ketchup. I’m never quite sure why this is such a firm favourite, but perhaps the children have been through similar experiences of having a meal at a friend’s house and finding that it’s not quite like it is at home. The text is simple and the illustrations certainly look friendly. 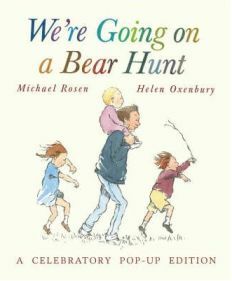 We’re Going on a Bear Hunt by Michael Rosen and Helen Oxenbury (Walker Books Ltd, ISBN 0774523230) is a story that probably appeals as much to adults as it does to children. A family sets off to look for a bear and has to go through all weathers and settings on the way. They encounter mud, for example, and say, ‘We can’t go over it, we can’t go under it; oh no, we’ll have to go through it!’ These words are repeated each time they come to a new obstacle, such as a forest or a snowstorm. Then follow onomatopoeic phrases that describe the experience, such as ‘swishy swashy’ for long grass. When they finally come upon a bear in a cave, however, they are terrified and rush back the way they came, so we see they journey in reverse order. They go into the house, run upstairs and jump into bed, only to realize that they didn’t shut the front door. Down they go to shut the bear out and feel safe at last. The bear wanders back to his cave and looks particularly forlorn; we feel that he was so looking forward to some company. These are the four books that I would recommend above all others, but there are of course many more that we enjoy. Doing the Animal Bop by J. Ormerod and Lindsey Gardiner (Oxford University Press, ISBN 0192791400) is a lively, rhythmic tale where children could get up and imitate the movements of the animals as the book is being read. Pumpkin Soup by Helen Cooper (Corgi Children’s, ISBN 0552556734) is the story of a cat, a squirrel and a duck that shows how we should share experiences fairly, allowing everyone to have a turn at doing different things in the process. The books in the series about Spot the Dog are always popular, especially as they involve lifting flaps to see who is underneath. The most successful reading-aloud sessions are likely to be those where the reader puts plenty of expression into the voices of the different characters. Rhythm, rhyme and repetition can also play an important part in making listening fun, and of course humour itself will always help children to enjoy following a story right through until the end. No Comments on "Great Read-aloud Books"